From September 17th to 20th, thedelegations from Graduate School, along with International College of Chinese Language and Culture(ICCLC) went to Indonesia and held the first postgraduateentrance examination under the overseas education project. The two colleges ofHNU inspected the local Chinese culture and language education and seek furthercommunication and cooperation. 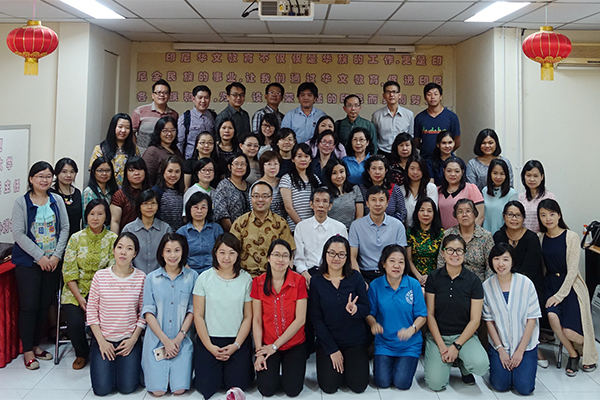 Mandated by the Overseas Chinese Affairs office of the State Council, HNU has trained nearly 200 Chinese teachers with undergraduate education background for Indonesia to professionalize the teaching team and equip them with higher educational background. This year marksthe launch of master degree education of TCFL major under the overseaseducating programs run by HNU in Indonesia. The entrance examination had twotest sites in Jakarta and Singkawang respectively. Nearly 70 Chinese Indonesianserving teachers or administrators took the test. The subjects tested were Advanced Chinese and Chinese Culture and Teaching. 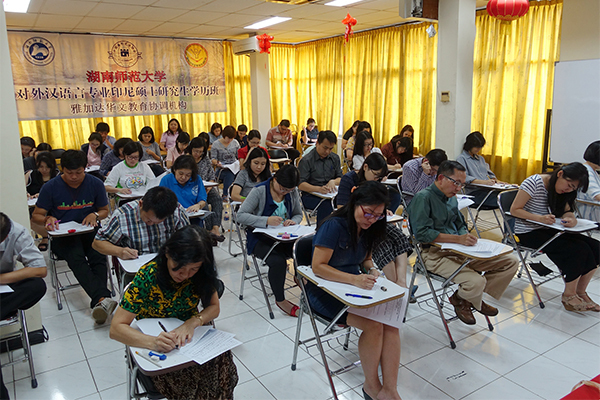 Xu Guang, director of Admission office ofGraduate School, Tian Tian, officer of Chinese Education of ICCLC, with Jakarta Chinese Language Education Coordination Agencies organized the examination. Theexamination reached a complete success with strict discipline and well-ordered process. Indonesia is the country with the largest number of overseasChinese. For historical reasons, its Chinese language and culture education had once suspended for more than 30 years. Aging and shortage of Chinese languageand culture teachers is the current situation in Indonesia. Multilevel academiceducation for young overseas Chinese and serving teachers can professionalizethe teaching team, as well as further spread and inherit Chinese language andculture in foreign lands. Hunan Normal University is one of the three universities designated by Overseas Chinese Affairs Office to conduct master degreeeducation for overseas Chinese language teachers. Also, this is HNU’s first overseaseducation project in postgraduate level.